The Mazda LF-DE is a 2.0-liter inline 4-cylinder gasoline engine. It is a member of the Mazda’s L-series. It was first introduced in 2003 model year of the Mazda3. This engine also has different later versions – LF-VE and LF-VD. The LF-DE has a high-grade aluminum alloy cylinder block with cast iron sleeves. The engine shares the 83.1 mm (3.27 in) stroke of the 1.8L engine (L8-DE, L8-VE), but the bore is larger - 87.5 mm (3.44 in). Unlike the 2.5-liter version L5-VE, the 2.0L engine doesn’t have balancer shafts. The LF has an iron crankshaft with four counterweights and a torsional damper. In 2009, the iron crankshaft was replaced with a forged steel crankshaft. There are forged connecting rods with fraction-split ends, aluminum alloy pistons with graphite-coated skirts for friction reduction. The pistons are placed with the offset by 0.8 mm. The 16-valve cylinder head with double overhead camshafts is made from aluminum-silicon alloy. The camshafts are driven by a link grounding type chain automatically tensioned using the engine oil pressure and the spring (the timing chain is maintenance-free). The head has the 39 degrees angle between the intake and the exhaust valves. There are solid bucket tappets, and the valve gaps need adjustment periodically. The LF-DE intake valve lift is 8.8 mm; while for the LF-VE, the intake valve lift was increased up to 9.1 mm. They both have the exhaust valve lift of 7.7 mm. The LF-VE engine was equipped with the S-VT system (Sequential Valve Timing) and a variable length intake manifold. The LF-DE and LF-VE engines have sequential, multi-point electronic injection system, while the LF-VD version has DISI direct fuel injection system. All versions were equipped with the electronic ignition system and individual ignition coils for each cylinder. The LF engines come with stainless steel exhaust manifolds/headers and the catalytic converters. 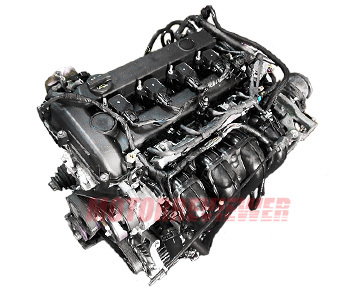 As was mention before, in 2009 the LF-VE engine for the Mazda MX-5 received some updates. It got new pistons, forged crankshaft, valve springs and connecting-rod bearings. The maximum power now produced at 7,000 rpm and redline is at 7,500 rpm. The LF 2.0L engine isn't quite as smooth as the 2.3-liter version. There is a power difference also, but it's not huge. The common problem is high oil consumption after 100,000 miles on it. The weak point is valve stem seals. Bad connecting rod bearings also cause oil consumption. The engine has problems with thermostat often at 60,000 miles. The engine does not warm up or on the contrary, overheats due to a stuck thermostat. Cars with the LF-VE had some issues with acceleration and Check Engine sign. That problem is a variable intake manifold which doesn’t operate properly or even doesn’t operate at all. The special valves inside don’t open the second path after 3,000 rpm. Overall, the engine is quite reliable and durable. The manufacturer says the engine life is more than 200,000 miles, and real-life operation approved that.